Welcome to our vintage fashion blog! Keep up with what’s happening at Backward Glances! 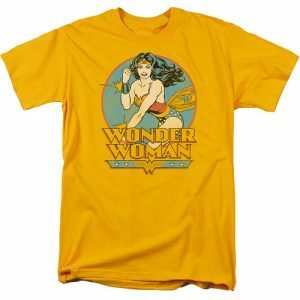 Check out this page regularly to find out about special promotions and sales going on here at Backward Glances, as well as fun things going on in our hometown of Asbury Park. We’ll be posting articles about the history of vintage fashion, features about fashion icons of the past, and cool places to go and wear your vintage clothes. Those are just some of the upcoming vintage fashion blog we’ll be posting. Stay tuned! 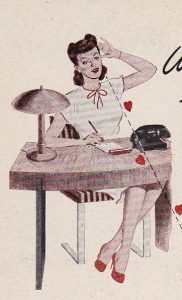 And don’t forget to like us on Facebook and Instagram to find out even more about the fashionable doings at Backward Glances, your one-stop vintage shop! It’s time for some Fall fun in Asbury Park! October is a busy month in Asbury Park; you won’t believe all the Fall fun going on the next few Saturdays. This Saturday, October 7th, it’s the 10th annual Asbury Park Zombie Walk! This is always a frighteningly good time. A Zombie Walk is an organized gathering of people who dress up in zombie costumes and then converge quickly in a public area for surprise and fun. 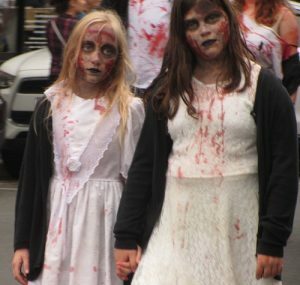 Our Zombie Walk has set the Guinness World Record for the “Largest gathering of zombies” two separate times. In 2010 the record was claimed with 4,093 undead counted on the Asbury Park Boardwalk. The record was later reclaimed in 2013 with 9,592 participants. Show up at the Boardwalkand join in the Jello brain-eating contest, give blood at the Bloodmobile, then shamble down Cookman Avenue. Saturday, October 14th is the next edition of Asbury Underground. Visit our event page to find out all about this wonderful day of free music, and our show here at Backward Glances with Tara Dente. On Saturday, October 21st, it’s time for more free music at the Asbury Park Porchfest. The concept is based on an annual event that started in Ithaca, NY and is now held in multiple towns and cities across the country. Watch local musicians playing on front porches of beautiful old houses all around Asbury Park. Proceeds from the event will go to the Asbury Park Shade Tree Commission. If all this fall fun makes you hungry and thirsty, it’s Octoberfest time at the Asbury Park Festhalle and Biergarten. This event is being held every weekend throughout October. There will be polka bands, pig roasts, games, and lots of beer. 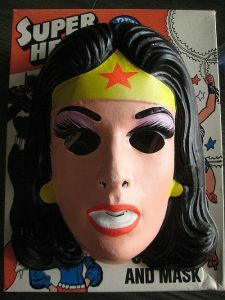 And don’t forget that you can stop into Backward Glances to shop for the coolest Halloween costume in the midst of all this fun. It’s Labor Day weekend– the end of Summer 2017. What a season it has been. It might be the end of Summer, but as the Beach Boys said, “We’ve been having fun all Summer long.” Or was that Kid Rock? Asbury Park had a bustling summer. Let’s hit some of the highlights: Wonderful outside shows at the Stone Pony Summerstage, but even better to be on the beach for Jams on the Sand. Monday nights you could recover from the weekend by heading over to Springwood Park for great free music or catch Stringbean and the Boardwalk Social Club outside Langosta Lounge. Just a few miles down the beach in Belmar, 90.5 the Night had Songwriters on the Beach every Thursday. How about August 26th? We had the Asbury Park Surf Music Festival, the Promenade of Mermaids, and Gary Clark Jr. at the Summerstage all on the same day! We’re celebrating Labor Day weekend with a sidewalk sale to get you ready for fall. 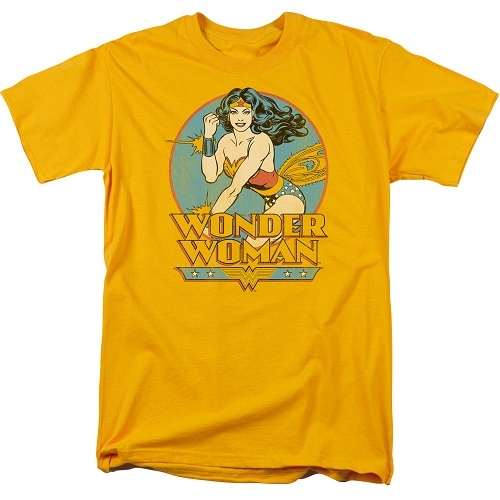 Stop by this weekend to do some early Halloween shopping, with brand new costumes for only $15 each. 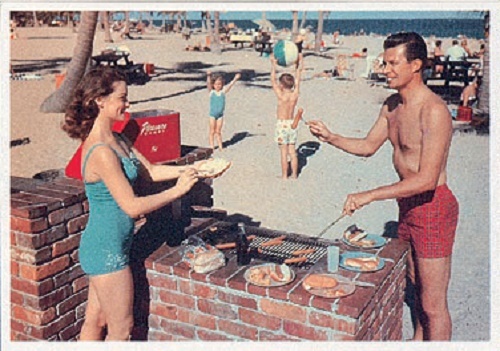 And Labor Day doesn’t have to mean the end of summer. September starts what we call “Local Summer” around here. Less crowds but still lots of fun. So enjoy this weekend and we’ll see you around Asbury Park. 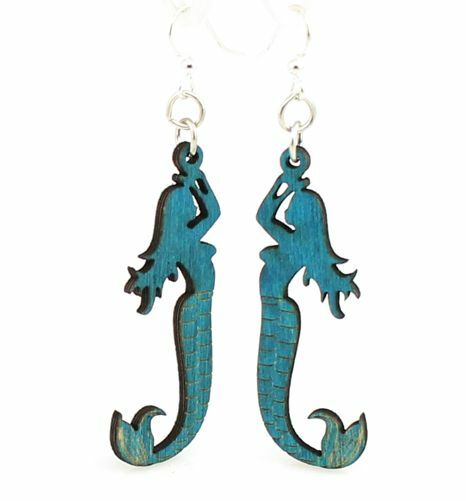 We’ve got new mermaid items! 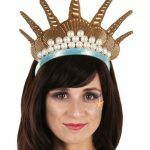 So it’s time to start thinking all about mermaids–the 3rd Annual Asbury Park Promenade of Mermaids is August 26th! So what do people love all about mermaids? What are these creatures anyway? 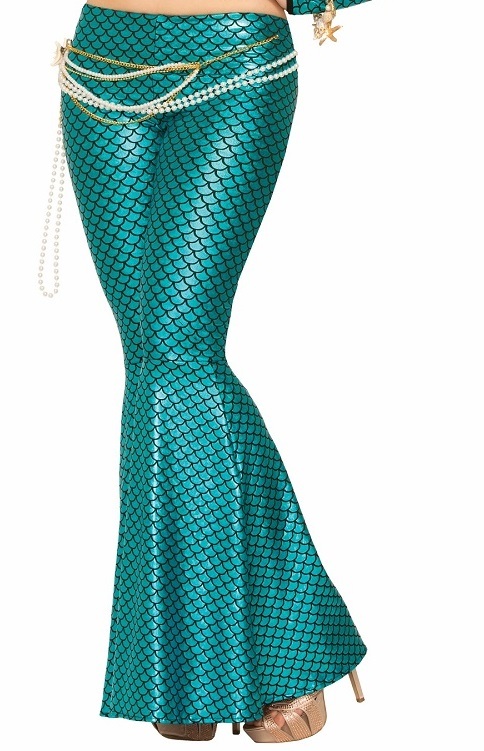 A mermaid is a mythical creature with the head and torso of a woman and the tail of a fish. (There are also mermen; more on that later). They appear in folklore all over the world, but the earliest tales come out of ancient Assyria. Christopher Columbus reported seeing mermaids in his exploration of the Caribbean. Even today, there have been reported sighting of mermaids in Israel and Zimbabwe! 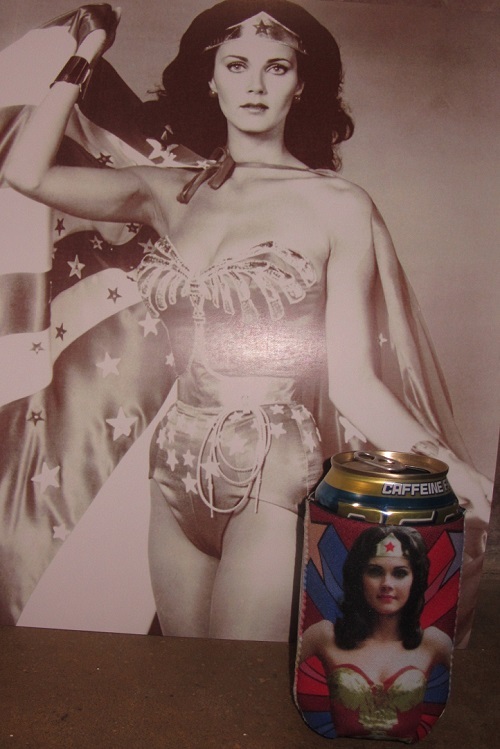 But here at Backward Glances, we love mermaids in pop culture. In 1836, Hans Christian Andersen wrote the fairytale “The Little Mermaid”. This romantic tale of a mermaid who has to become human to marry her prince, inspired a famous statue in Copenhagen harbor, erected in 1913. Of course, this story led to the Disney cartoon in 1989, and the Broadway musical in 2008. 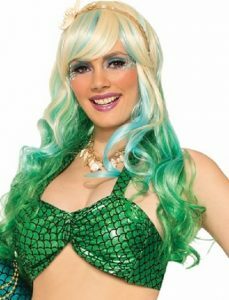 Mermaid kitsch in the Unites States began in 1947, when the mermaids of Weeki Wachi Springs in Florida started their shows. These professional diving girls have been featured on postcards and draw over one million tourists per year. Bette Midler has never been afraid to be kitschy. The Divine Miss M has had a mermaid character in her stage shows for years: Delores DeLago is a mermaid and Bette performs as Delores in a wheelchair (since a mermaid can’t walk). Here’s Delores in action in 1980’s “Divine madness”. In 1984. mermaids came to the movies in “Splash”. I loved this romantic film about Tom Hanks falling for Daryl Hannah as Madison the mermaid. A gender-reversal remake is now planned with Channing Tatum as a merman! Jillian Bell will be taking the Tom Hanks role. 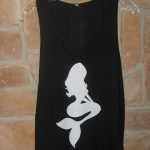 So people love mermaids! Coney Island has been hosting a Mermaid Parade in June for 35 years. Their parade attracts a couple of thousand participants, and hundreds of thousands of viewers. 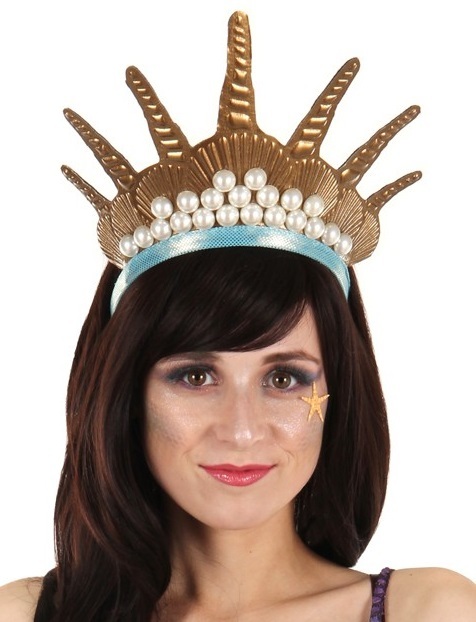 But Coney Island doesn’t have an exclusive on mermaids at the shore, so now the Asbury Park Promenade of Mermaids is here! The third annual procession is on August 26th at 2:00 pm on the Asbury Park boardwalk. Registration starts a noon. 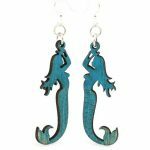 Come out in all your oceanic finery! If you need some help, stop in at Backward Glances for mermaid and pirate wardrobe and accessories. You can get some ideas here. 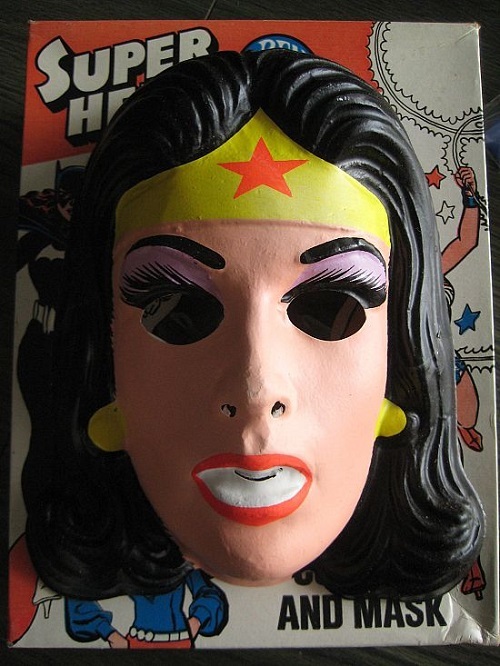 We’ve got these costumes out now–no need to wait until Halloween. And if you wait until the last minute, you will find Backward Glances at the Boardwalk on the day of the event, selling our wares in the Grand Arcade. 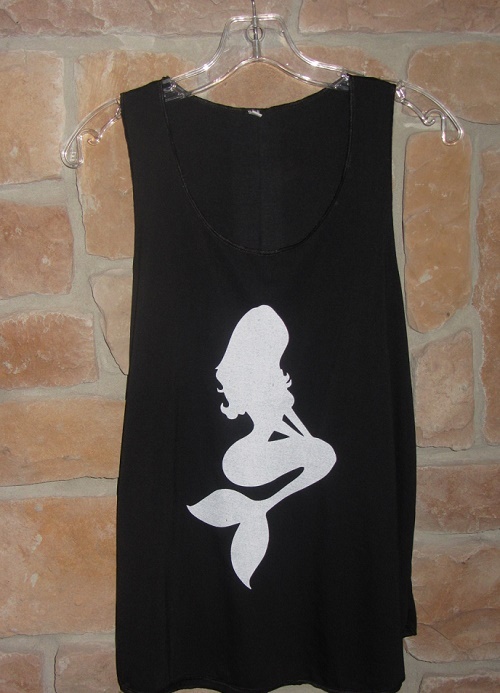 We’ll have the mermaid clothing, along with great vintage clothes, cool tank tops, and lots of other amazing items. And so ends our tale of the tail. See you in AP on August 26th. New Brunswick New Jersey Music: Where Are They Now? 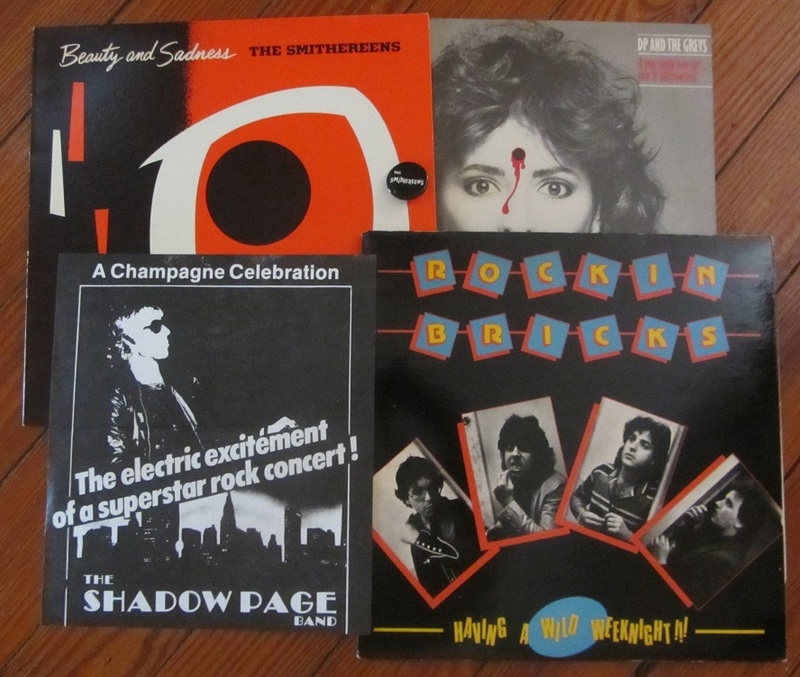 Recently we published our long-lost article on New Brunswick, New Jersey music from 1983. Here it is 34 years later, so we were wondering whatever happened to some of these bands, DJs, and clubs that were featured in the article. If you want to read the article it starts here. THE SHADOW PAGE BAND: put out their album in 1985 on Jerni Records. It was called “Hanging By A Thread”. Shadow later returned to his original name of Floyd Marcus, and returned to the 1910 Fruitgum Company. In 2007, they put out the “Bubblegum Christmas” album. Floyd left the band in 2008. He is now living in South Jersey, and is a solo performer. D.P. & THE GREYS: Most of the Greys later joined the Hub City Allstars, and Andy B (later of the VooDUDES–our Asbury Park Mardi Gras favorites) became their lead singer. Danny Petroni now plays the blues. After Hurricane Sandy, he formed the Blue Project, to create work for local musicians with a locally produced blues record, using his own compositions. They gig around NJ and NYC, and are based in (of course) Asbury Park. Here they are playing up in Harlem. Petroni’s new album “Run Mindy Run” will be released in October. You can visit his website here. 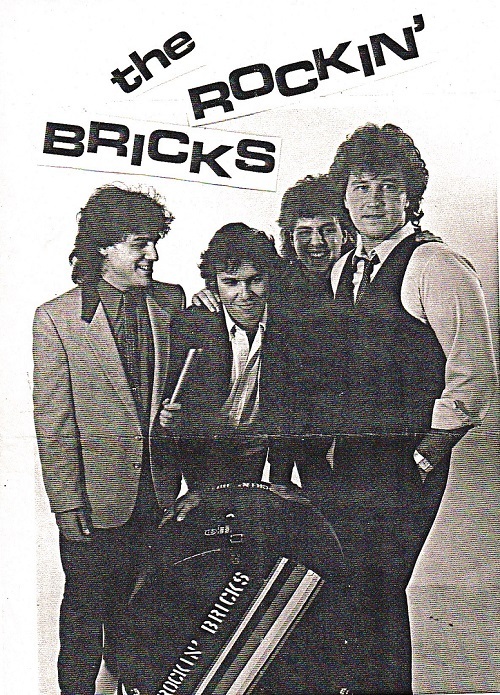 THE ROCKIN’ BRICKS: The Rockin’ Bricks broke up in 1983, soon after this article was written. Hope for a reunion has been dashed many times over the years. Bass player Chris Breetveld put out several albums as “the Breetles“. 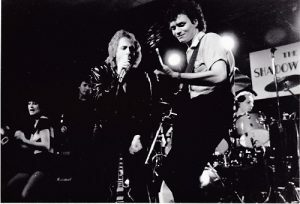 Guitarists Joe Hosey & Pete Tomlinson each had tracks on the 1986 album “The East Coast 60’s Rock & roll Experiment” (which featured many New Brunswick bands). “Scene maker” Tomlinson went on to record three albums with the Blood Rush Hour. In 1998 he showed off his extensive musical knowledge by winning the national Rhino Records Musical Aptitude Test. Pete was featured prominently in the 2013 Big Star documentary “Nothing Can Hurt Me.” He is now retired and living back in N.J.
JIGS & THE PIGS: are one of the two bands from the 1983 New Brunswick scene still playing. You can see them at clubs like the Brighton Bar in West Long Branch and Roxy & Dukes in Dunellen. Leader “Jigs” Giglio hasn’t lost his punk edge after all these years. Here they are playing a few years ago. You can also catch Jigs doing his interpretive dance to “the Twelve Days of Christmas” at Glen Burtnik’s Xmas Xtravanganza shows. It’s always a crowd favorite. THE SMITHEREENS: are the New Brunswick success story. Signed to major label Capitol Records in 1986, they went on to record seven albums of original material over the years, as well as tributes to the Beatles and the Who. Two of their singles charted in the top 40. They returned to the Court Tavern to record a greatest hits live album in 2008. They still tour, and are no longer just considered “Jersey Music”–they are billed as “America’s Band”. Original bass player Mike Mesaros left the band in 2006, but has recently rejoined and the band is planning a new album with the original lineup. 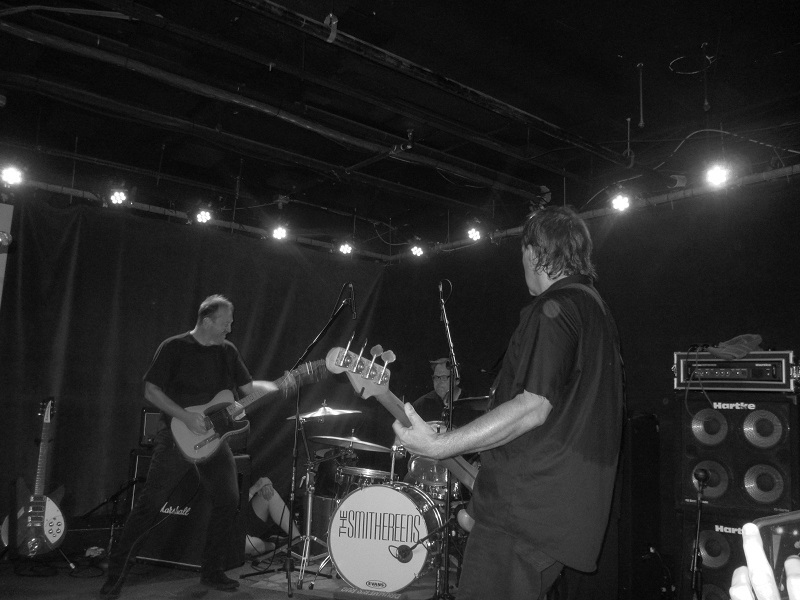 The Smithereens recently played two sold out dates at the Wonder Bar in Asbury Park. Here are a couple of photos from those shows. PATRIX: Unfortunately, this club only lasted a few years on the N.B. scene. It was the site of a well-reported sit-in by Bruce Springsteen with the John Eddie band in 1984. Owner Pat Fasano moved to Asbury Park and opened up the Bond Street Bar in 2009. Bond Street was joined by Capitoline and Loteria in 2016 to make up the Complex. All three fulfill Fasano’s philosophy of an inexpensive, quality “simple menu” that he visualized back in 1983. THE MELODY BAR: became a legendary hangout in New Brunswick. Known for its DJ sets by Matt Pinfield and sets by the Slaves of New Brunswick, it closed in March 2001. Several reunions of Melody Bar patrons and DJ’s have taken place since. MATT PINFIELD: is another N.B. success story. After his time at WRSU, he became a DJ at WHTG for 10 years. From 1995 to 1999 and 2011 to 2013 he was the host of the MTV show “120 Minutes”. In 2001, Matt became Vice President of A & R and Artist Development for Columbia records. Matt was honored by the Rock n Roll Hall of Fame in 2008 for his accomplishments in the music industry. In 2016 he published a memoir “All These Things That I’ve Done: My Insane, Improbable Rock Life”. He still works in radio for Sirius and Cumulus. THE COURT TAVERN: has been declared dead numerous times. It almost closed in the early 2000’s when the city of New Brunswick wanted to build a high rise in its location, but it survived. In 2009, it almost closed due to back taxes. A benefit concert was held at the State Theater starring the Smithereens and Patti Smith, and it survived. In 2012, it closed, but a new owner purchased it, and it was back. It closed briefly again in 2015, then reopened a short time later with new management. The Court Tavern may survive the apocalypse. In 2017, the Court Tavern is still rocking! BUT THERE’S MORE: One of the bands is reuniting! Read our update from November 2017 here. It’s time for our last listen to New Brunswick music in the 80s. 1983 to be exact. Hope you’ve enjoyed this look back. When I wrote this article, I didn’t expect the music in the 80s to be such a big thing 34 years later. 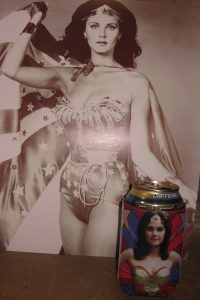 Like 80’s fashion, it may seem a little dated but also reminds us of the good times of our youth. I spent my twenties hanging out in New Brunswick, NJ, in a music scene that seemed about to break nationally. If you need to review parts one, two, three or four, you can click here. Let’s go back one more time . . .
Cheap Thrills record store owner Steve Kaplan reports that D.P. and the Greys’ album is one of their strongest selling independent records. Kaplan says that “indie” records do very well in his store, and that people do come in and ask for them. As manager of the Shadow Page Band, Steve Kaplan has a large interest in original music. The Shadow Page Band is one of the newer groups on the New Brunswick scene, having only been together since September of 1982. They have spent recent months working on an album entitled “Page One”. They hope that this will cause the group to be signed by a major label company. “I won’t sleep until we are, ” says Steve Kaplan. However, Patrix and the Court are not the only places in New Brunswick that have live music. The Melody Bar, at 106 French Street, has live music on a weekly or bi-weekly basis on either Wednesday or Sunday nights. With or without live bands, the Melody is considered the trendy place to have a drink. Manager Chris Butler says that the crowds that come there are “diverse”. No cover is ever charged. For a change of mood, one can go to Rhyan’s, at 392 George Street. Just two blocks away from the Court Tavern, they are miles away in terms of style. With its old-fashioned elegance, and cover bands ranging from soft rock to Irish music, Rhyan’s is the final proof of New Brunswick’s musical diversity. What is ahead for New Brunswick musically? Most people tend to agree that it will develop even further. Most people compare New Brunswick’s immediate future not to Liverpool, but Hoboken, NJ. In the past few years Hoboken has gotten a reputation as a music center, through its well-known club, Maxwell’s. A Hoboken band, The Bongos, were signed to a major label and enjoyed some success. New Brunswick has had its success stories in the past. The band Looking Glass, who had a number one hit in 1972 with “Brandy (You’re a Fine Girl)”, was composed of four Rutgers students who got their start playing locally. Eddie Cooley, who wrote “Fever”, a hit for Peggy Lee, is from New Brunswick. Yet it seems that this time around, New Brunswick music is ready to explode. “One band will be the standard bearer, and get signed, ” says Pete Tomlinson. In the meantime, you can see these bands before the rest of the country does. This article highlighted five groups, but New Brunswick is overflowing with talent: The Ice Cream Men, Terry Hughes, Freddy and the Flinttones, Louie Louie, The Surfers from the Future, TMA, the Boogles, the Young Turks, The Mersey, Jon Waine, the Deed, Communicators, The Groceries, J.P. Gotrock . . .
“The bands are still accessible to the audience, not like in a big town like New York. Everyone can talk, ” says local musician and WRSU music director Steve Maffei. Or is it? We’ve got a 2017 update! You can see it here and find out what happened to the New Brunswick scene makers and clubs in the past 34 years. 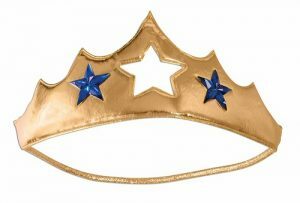 Are you mentioned in this article? Drop us a line at info@backwardglances.com and tell us your N.B. memories and what you’re doing now. 1980’s New Brunswick Bars & Bands: Patrix & D.P. Let’s flashback to some more 1983 New Brunswick bars, and the bands that played there. The heady music scene in the New Brunswick bars inspired me to write this article back in 1983. I can see many parallels between the New Brunswick scene in the 80’s, and the Asbury Park scene of today. This segment (part 4 of this previously unseen story), shows one reason for that. Let’s meet Pat Fasano–in 1983 he was proprietor of the newest club in town, Patrix. Today, he is owner of three unique bars in downtown Asbury Park, which make up the Complex. Read on. Located at the other end of town, near the Douglass College campus, Patrix (at Handy and Throop Streets) has only been open since this past New Year’s Eve. Somewhat bigger than the Court Tavern, Patrix has a low admission policy: two dollars on weekends, one dollar on band nights during the week, and free on Sunday and Monday when deejays from WRSU spin records. The Patrix crowd certainly seems comfortable in this new nightspot. As at the Court tavern, the dance floor is crowded with people enjoying themselves. “I think that in a short time, before the year is out, people that live in Middlesex County won’t say, ‘Let’s go to New York and bar-hop’, they’ll say, ‘Let’s go to New Brunswick and bar-hop'”, Fasano says. “Having a lot of clubs in one town is good because they can say ‘We can go here and here and here and it’s all five minutes away'”. “Patrix is my favorite bar in New Brunswick,” says Dani Petroni, leader of D.P. & the Greys. D.P. and the Greys have been together for a year and a half, and are the first New Brunswick based band to put out a full album of original material. “If You Really Love Me . . . You’ll Kill yourself” (on independent “Grey Boy” records) was released in April, and contains seven Dani Petroni songs. D.P. calls his music “no wave–a mix of rhythm and blues, funk, reggae, and rock and roll”. D.P. and the Greys may possibly be the only band in New Brunswick with a horn section–and they are definitely worth checking out. “New Brunswick has been my testing ground for the last year and a half. If it’s a sample of the potential of this band, then we’ll do well. We’ve got a following in New Brunswick . . . They’re called ‘Grey People'”. No matter how large a following a band has, putting out an independent record is difficult financially. Most original musicians have to take day jobs just to support themselves. Grey’s business manager Dan Pollera says that only the combination of D.P.’s technical experience, enabling him to cut corners in the studio, and Pollera’s business know-how made the album possible. Right now, Dani Petroni describes the main goal of D.P. and the greys as getting their music to different kinds of people, “not just a certain group”. He would like to tour Europe within the year, and eventually get to the point where they can make a living from their music. However, at present money is not the main objective. “If I was into making money, I would have become a dentist, ” says D.P. COMING UP IN PART 5: We’ll finish it off with Shadow Page, the Melody Bar, and what’s ahead for New Brunswick (or what we thought was ahead in 1983!) Visit our blog to read the ending! Still need to read parts one, two, or three? Visit the links here! It’s Throwback Thursday, with another flashback to the Court Tavern New Brunswick. Welcome to Part 3 of the lost article on the New Brunswick, NJ music scene, circa 1983. This week we’ll be looking at a couple more of the bands that played at the Court Tavern in its heyday, and checking in at WRSU. If you missed part one or part two, there’s still time to catch up. One of the earlier bands to play at the Court Tavern was Frozen Concentrate. This band has been together for a little more than a year, but band members Tina Maschi and Amy Wolk are no strangers to the New Brunswick music scene. As members of the ground-breaking Celibate Sluts, they and the Rockin’ Bricks were practically the only bands playing in New Brunswick three years ago. Tina Maschi stresses that Frozen Concentrate’s “bluesy, soothing, spacey, jazz rock” sound is worlds away fromthe off-color, punkish rock of the Celibate Sluts. It is also extremely dissimilar from the music of any other New Brunswick-based band. “There’s a lot of different styles in New Brunwick,” says Maschi. “All the bands have a different approach, ” says Rutgers station WRSU deejay and producer of the band the Null Set, Matt Pinfield. 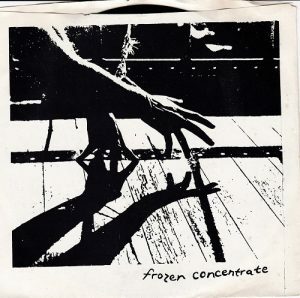 Maschi writes the lyrics to Frozen Concentrate’s songs, and the music is a collaborative effort. The band’s single “Too Many Lives” was released in January, on their own in-town label “Melted Records”. With most of Frozen Concentrate living in New Brunswick, they enjoy playing for Hub City crowds. Frozen Concentrate’s horizons are not limited to New Brunswick. There is talk of touring places like California and West Germany. “New Brunswick is a great starting place,” Maschi says. Tomlinson is somewhat of an expert on area music. In addition to his local band experience, he writes the rock music column for the New Brunswick Home News, and is assistant manager of Cheap Thrills record store. He is the kind of person WRSU music director Steve Maffei refers to when he talks about New Brunswick “scene makers”. Because they devote much air time to local music, WRSU (88.7 FM) is a prime factor in the New Brunswick music community. Many WRSU deejays are heavily involved in the band scene. Maffei reports that the listeners seem to love hearing local groups; the Rockin’ Bricks were even included in their “Top 88 Hits of 82” listener poll. The Rockin’ Bricks continue to be one of New Brunswick’s most highly regarded bands. Their shows still amuse and surprise even their most loyal fans, with their wise-cracking dialogue between songs and their inclination to break into a polka in the middle of a sixties classic for no reason at all. The band’s special pop sound can be heard on last year’s four-song EP “Having A Wild Weeknight” (on “Major Label” records). A new record is due out by September. 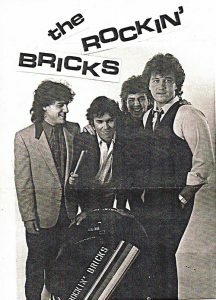 The Rockin’ Bricks have the distinction of being one of the few bands to have each member do some songwriting, and are also on the the few to have played at all of New Brunswick’s original rock clubs: The Court Tavern, Melody Bar, and the newest addition to the club scene, Patrix. Take a trip back on our blog every Thursday for the rest of the article. Let’s go back to the 80’s with Jim Babjak, Mike Mesaros, Dennis Diken, and Pat Dinizio, AKA The Smithereens. 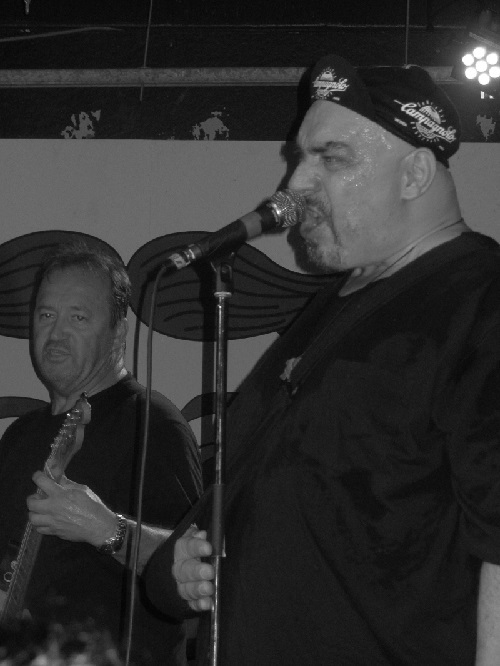 The Smithereens are perhaps typical of the type of band that plays at the Court. They have been together for three and half years, but like most original groups, each have at least ten years musical experience. Yet they are only in their mid-twenties. The Smithereens have built a following around the state, and play quite often in New York City’s original music clubs, as many New Brunswick bands do. Guitarist Jim Babjak lives in town, and owns a record store, Flamin’ Groovies, on Easton Avenue. However, the band only began playing the Court Tavern in recent months. They liked it so much that they have become semi-regulars. On a Smithereen evening at the Court, you can hear the band perform the best of British music from the sixties, American surf instrumentals , the group’s joking tribute to a hamburger chain “White Castle Blues”, and of course, their snappy, professional-quality original songs. In short, anyone is in for a lot of fun. “When you play here, you don’t feel any pressure. It’s looser and more fun, ” Mike Mesaros says. 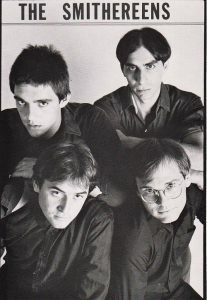 Like many New Brunswick-based bands, the Smithereens have released their own records while awaiting major label connections. Singer Pat Dinizio does the songwriting. Both Smithereens records have been four-song EP’s, with the newest, entitled “Beauty and Sadness“, just released in June. Frequent plays of one song, “Much Too Much” on Rutgers radio station WRSU has already inspired a cover version by local copy band The Exceptions. “It’s one of the biggest compliments you can get, ” says Babjak. “Being in an original band gives you a sense of pride. And it’s a challenge to succeed with your own songs, amongst all the big supergroups,” Babjak says. Coming up in part 3: Frozen Concentrate and the Rockin’ Bricks play the Court Tavern; & WRSU supports the local music scene. Where were you in 1983? I was hanging at the Court Tavern. 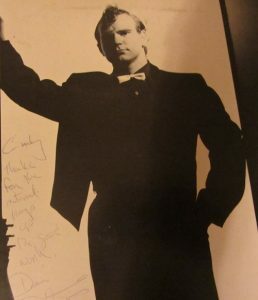 Back in 1983, I was a young writer, selling articles to mainstream New Jersey magazines. I was also an avid rock n roll fan (still am!) and wrangled an assignment to do an article on the happening music scene in New Brunswick, NJ. I interviewed the musicians on the scene and owners of the clubs such as the Court Tavern, Patrix, and the Melody Bar. Because of changes on the editorial staff of the magazine, this article was never published. UNTIL NOW! Asbury Park is now booming like New Brunswick was back then. And with the original 4 Smithereens set to play the Wonder Bar in Asbury Park on July 2nd & 3rd, it seems like a good time to take a trip back 34 years . . .
Something musical is happening in New Brunswick. Literally, the signs are everywhere. All over town, on every empty wall, lamp post, and bulletin board, the passerby sees band advertisements. The names are catchy but probably unfamiliar: Frozen Concentrate, Jigs and the Pigs, the Shadow Page Band, the Null Set . . .
There’s a good possibility that even if you’ve never heard of these bands, you will be hearing a lot of them in the future. They are a few of the many acts currently playing original music in New Brunswick’s new and expanding night clubs. They may well by on their way onto the Billboard charts themselves, but you can see these bands at clubs like the Court Tavern, Melody bar, and Patrix right now–for little or no cover charge. New Brunswick is not just for college students. It’s the happening place for anyone who likes music. The Court Tavern, at 124 Church Street, has been having live music since October of 1981. As one of the first places in New Brunswick to host original bands, it has built its reputation on two things: its relaxed atmosphere, and policy of no admission–ever. Currently the Court Tavern has bands Wednesday through Sunday nights. The Court Tavern has two floors: the upstairs, nearly empty on band nights, is a pleasant place to get away from it all, have a drink or order some food. Downstairs, the scene is totally different. It is apt to be packed on band nights. The main room containing the bar and the stage has few seats, but the objective there is to dance. Renovations will be done within a year in the band room to allot more dancing space by moving the bar and stage. However, no one really minds the way it is now. The close quarters promote more camaraderie between the patrons, and between the audience and the band. The general atmosphere is like going to a private party, with all your friends. Coming up in part two of “New Music”: meet the Smithereens. Visit our blog each week for more installments on Throwback Thursdays, as we meet the bands and visit the venues of 1983.